Deh-GIHM! Greetings, traveler, and welcome to the TFL-listed fanlisting for the classic Disney film, Atlantis: The Lost Empire. Please feel free to take a look around the site, and if you're a fan of this great movie, be sure to join the list! Enjoy your stay in Atlantis! We have a new member--welcome to Qkudu! Here are the rules for joining the fanlisting. I know, I know. Rules put a damper on the party. But these ones are easy, I promise! 1) Obviously, you must be a fan of the Disney movie, Atlantis: The Lost Empire. 2) You have to provide a name. It doesn't have to be your REAL name, a screen name will work just fine. That way, we can list you. 3) You also have to provide your geographic location and your e-mail address, but if you don't want your e-mail made public, just let me know and I won't display it. 5) Please, no direct linking! Those aren't hard, right? ^_^ Now, please feel free to join! If you've read the rules and chosen a link button (if you have a website), then you're ready to join! You can also view the memberlist and see how many Atlantis fans there are, and update your info if you're already a member. I'm looking for affiliates who run Atlantis or Disney-related websites and fanlistings. Interested? The layout for this fanlisting was made using a blend of screencaps from the movie and the Japanese movie poster (sent to me by Rebmakash). The programs used were Cyberlink PowerDVD, ArcSoft Photostudio 5, Jasc Paintshop Pro 7, and Pixie. All characters, situations, items, etc. 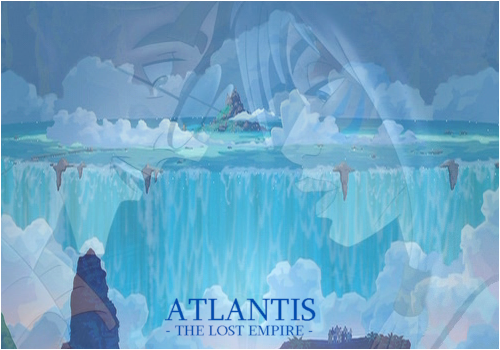 related to Atlantis: The Lost Empire are property of Disney. I am in no way affiliated with them, and no profit is being made off this fanlisting save enjoyment.